We're midway through our month of salads and I'm feeling pretty good. Other than our wedding night (and Kol Nidre when we went to the shul straight after work and got home pretty late - had a handful of peanuts and a Chobani and passed out for the night), I've had a salad every single day for either lunch or dinner. Some have, of course, been better than others, but all in all, I've enjoyed them, and and I'm liking how I feel - lighter, less bloated. It's a good feeling. First, a not-so-great one, though delicious in theory. 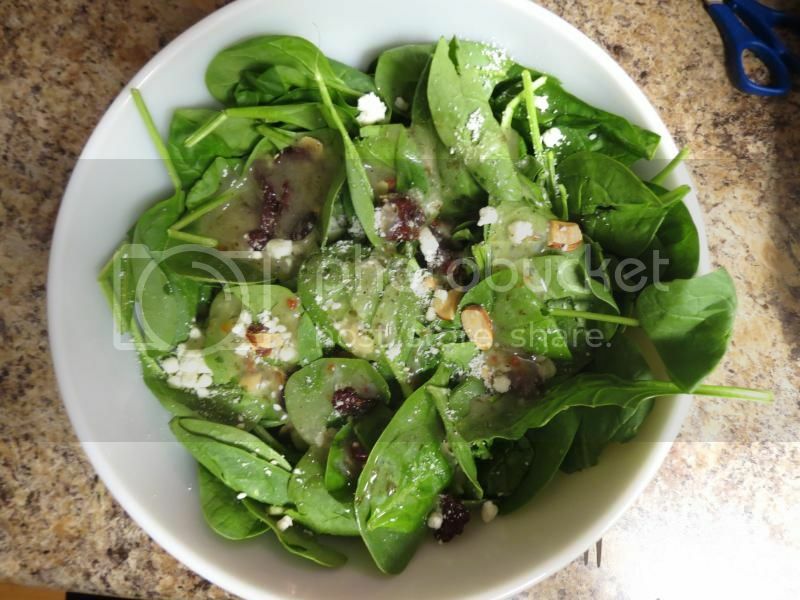 This was a premade salad kit: cherry, almond, blue cheese, and spinach. Super disappointing for how many calories were in it! 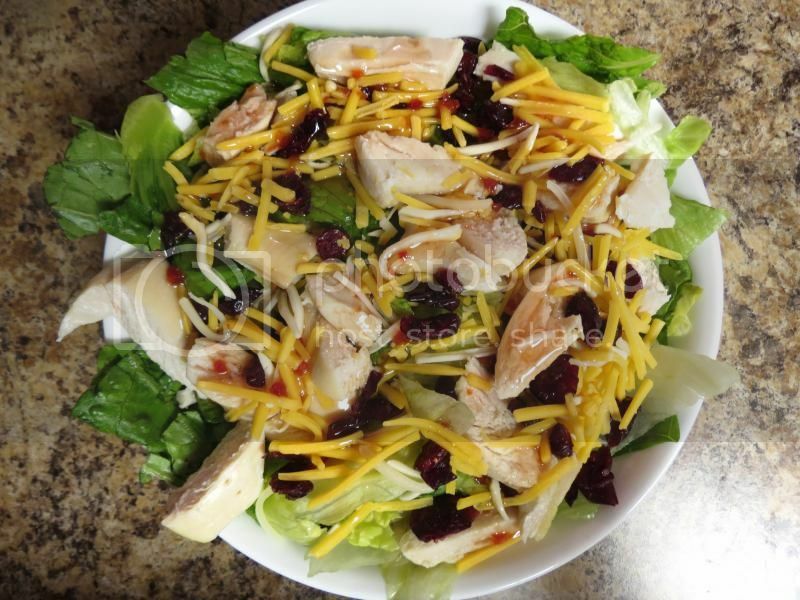 I made something similar myself, and after using my own lighter vinaigrette, reduced sugar Craisins, and no nuts, I was able to have a much bulkier salad for the same number of calories. And with chicken! Some salads have been pretty simple, but there's nothing wrong with that! Sometimes simple is good. 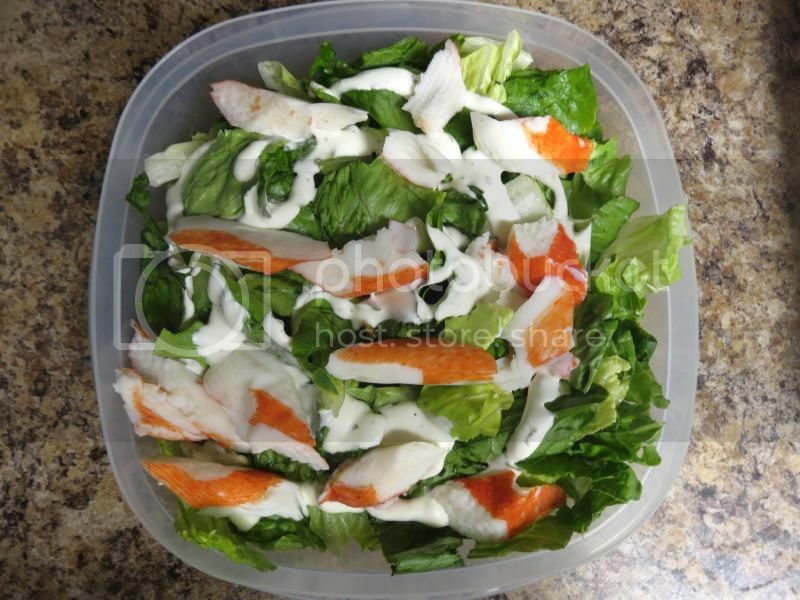 This one is a good once-in-a-while salad: romaine with imitation crab meat. I like it but it's high in sodium so I don't buy it often. This was a quick and easy lunchtime staple when I was living in California: mixed greens with a Lean Cuisine dumped over the top. No need for dressing or anything else, the sauce makes it saucy enough! 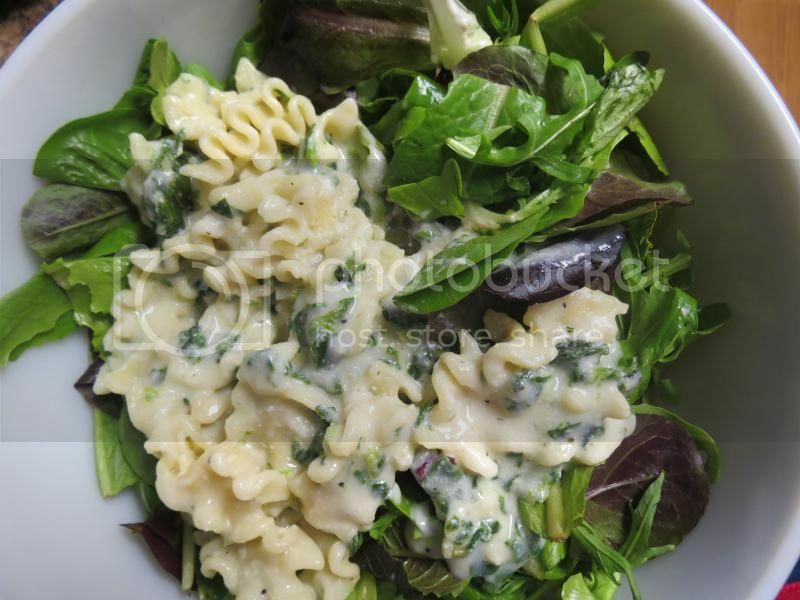 This is a Weight Watchers one, pasta with ricotta and spinach. Looks gross, but tastes pretty good! A giant fast food billboard inspired this one: a healthier take on a Big Mac. 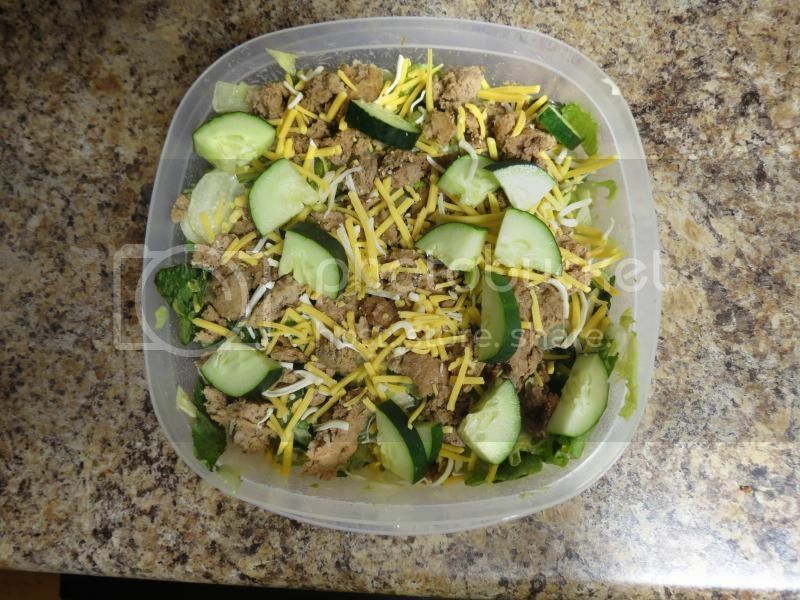 Ground turkey, shredded cheese, light thousand island dressing, and sliced cucumber (instead of pickles for less sodium and more crunch!). Not gonna lie, I've had three or four salads that look like this. It's simple but delicious: just whatever greens (usually spinach or romaine) topped with a few over easy eggs. 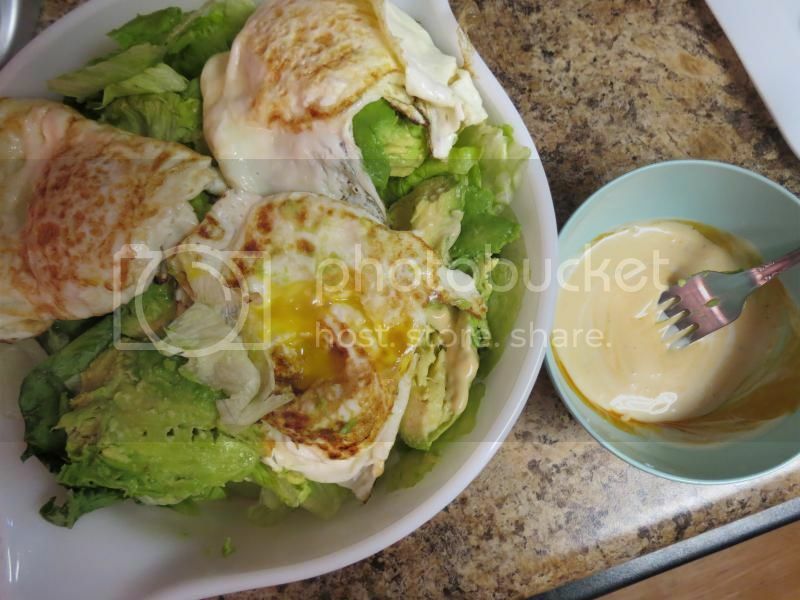 The eggs are hot and drippy, you don't need much dressing. I do mine on the side and dip the fork for this one - mixed ranch with buffalo wing sauce to give it a kick. In a few salads, I've chopped up a cold baked potato and added that. With the eggs, it's a great combination. In this particular one, though, I forewent the potato for avocado - I was craving it! So good with eggs. We still have a few more weeks to go, so I'm looking for ideas. Most of my salads tend to be simple, as I'm sure you can tell - tonight's, which I forgot to take a picture of, was romaine topped with a piece of honey chipotle salmon. What about you? Any ideas? What are your go-to salad toppings? My most favorite addition is a hard boiled egg. I bake and refrigerate tilapia then put that or canned tuna on greens. Yesterday I used turkey pepperoni with a cut up slice of mozzarella and fat free Italian and it was SO GOOD. I usually use left over dinner to throw in too, baked pork chop or chicken breast, ground turkey...whatever I have. I always have tomato and cucumber. :) I have to switch up my greens a lot too or I get bored. I will be trying some of your combos! baby spinach, shredded carrot, sprouts, cucumber, avocado, goat feta with sunflower seeds. Sometimes I also add peppers, tomatoes, jicama - but I try not to go too wild (especially during my trying to save on groceries mission). Usually our go-to dressing is olive oil and balsamic vinegar. equal parts seasoned rice vinegar and canola oil, salt, pepper, garlic and a bit of brown sugar. It's honestly the best dressing EVER. Here's what I'm currently eating (all cut up very small, as I'm a bandster): endive, goat cheese, apple and toasted almonds, in a vinaigrette. Sometimes I'll put some sliced black olive in there, too. I've been eating a TON of salads lately. I eat them for lunch and make sure to add some protein (usually hard-boiled egg, turkey, sunflower seeds, and cheese). It fills me up without making me feel bloated, just like you said, and I feel so much healthier! I'm definitely going to try your "Big Mac" salad. That looks amazing. I also do the "dip the fork" method. I'm not crazy about dressing, and I find that dipping the fork gives me just enough for flavor without feeling too dressing-y. Oh, and the Lean Cuisine dumped on top of salad greens? Mixed greens, tomatoes, dried cranberries, almonds, balsamic vinegarette, and goat cheese crumbles. Beans! Top lettuce with beans and salsa for a "taco" inspired salad. 3 bean salad is super tangy and vinegary and would go well over romaine with tuna. Those are some of my favorites!! I'm on a taco salad kick right now: romaine lettuce, a few grape tomatoes, shredded cheddar, baked tortilla chips all crushed up, with some spicy black bean salsa or Chipotle Cholula hot sauce as a "dressing". If I have leftover chicken, I'll throw a bit of that in as well, or some avocado. Yum! My husband also really likes the salsa-type salad I make when the weather is warm: 1 can of corn, 1 can low-sodium black beans (rinsed), 1/2 pint of grape tomatoes (halved), 1/2 of a medium-sized red onion (minced) with a little bit of lime juice and honey as "dressing" and a dash of salt and pepper. It goes with just about everything, and a batch will last us for a couple of meals. I almost always use romaine or kale or a mixture of the two for the base of my salad. I try to mostly have vegetables with a little protein. I use red onions, cucumbers, tomatoes, and a few olives. I vary between some cooked chicken, canned tuna, half a cup of cottage cheese or a sprinkle of feta. I usually have a dressing of a teaspoon of olive oil and two teaspoons of apple cider vinegar whisked together with some black pepper. It took a while before I was able to wean myself off the bottled dressings but I did it. Interesting! I'm not a salad lover, but once in a while I get a craving for one. Craisins are my FAVORITE salad topping! Ooh some of those do look good. Avocados are my favorite food but I never thought they would be a salad topper. I may have to try that. lol. My favorite salad to make right now goes like this. Bed of spinach or spring mix of dark leafy greens topped with one hard boiled egg, shredded carrots, diced tomato, and a sprinkle of almond slices. My go to dressing used to be the lightest calorie version of Italian dressing but right now I'm loving something by kraft called Sun Dried Tomato basil. It has quite a few more calories in it but if I go easy on the dressing its not too bad and very very delicious! I think maybe though you could try other salad ideas that don't involve leaves unless that was specifically what you were going for. If not though you could try like a pasta salad or tomato and cucumber salad or just a fruit salad or even a taco salad. So many different choices with those.